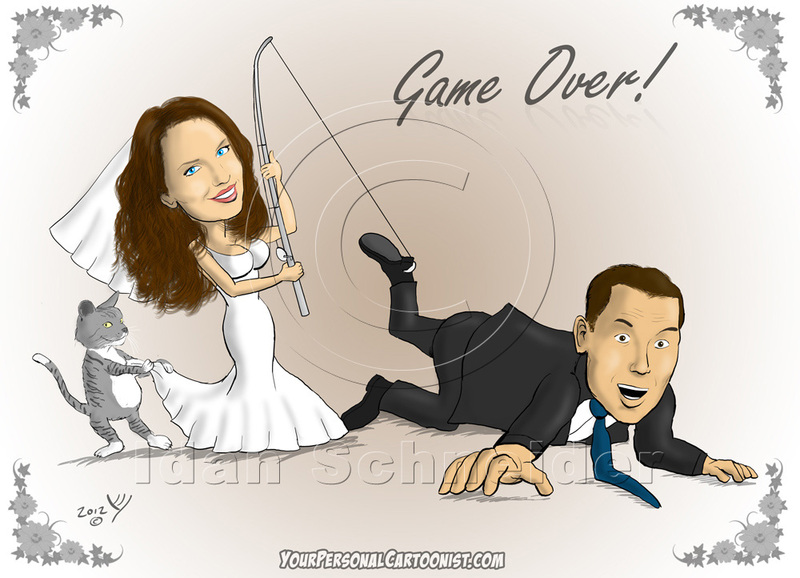 Another funny caricature that I drew for a wedding invitation. 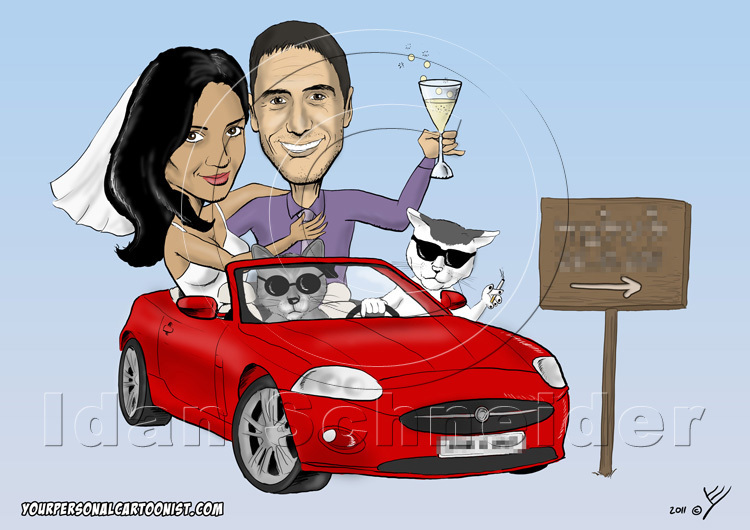 This one shows the bride and groom, sitting in the back seat of a red sports car, while their two cats are driving the car. They told me the cats are the bosses in the house, so I drew them as a couple of gangsters, sunglasses and all. The couple used the caricature for their wedding invitations, party favors, and also printed T-shirts with the caricature for their friends. Would you like a similar caricature for your wedding invitation, engagement party invitation, or something funny for your showers or rehearsal dinner invitations? I will gladly draw a funny caricature of you for your wedding, in a similar style, in a setting of your choice. Click here for additional details. This particular wedding caricature is one of my favorites. The bride came with the idea of drawing a realistic looking wedding invitation, while making fun of the whole concept of weddings. She asked me to draw her in her wedding dress, holding a fishing pole and pulling back hard with the hook caught on the groom’s leg, and him grabbing for dear life. The caption was also her idea – “Game Over”. I also drew her pet cat helping her pull, while having a mischievous smile on her face. Getting married? Want a caricature for your wedding invitation, engagement party invitation, or something funny for your showers or rehearsal dinner invitations? I’ll draw a funny caricature of you for your wedding, in a similar style, in a setting of your choice. Click here for additional details. 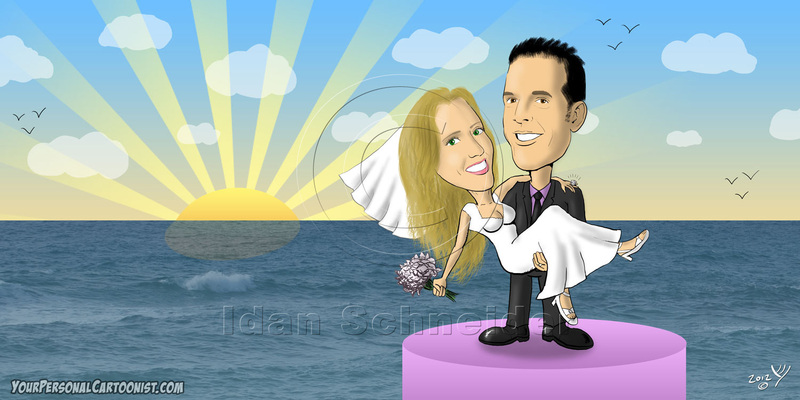 I drew this wedding caricature for a lovely couple from South Africa. 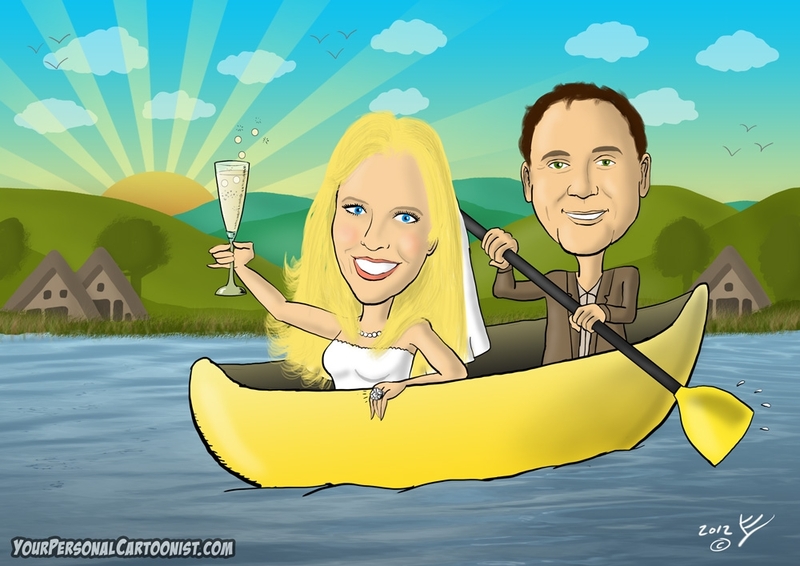 Their wedding took place at a canoe lodge, so I drew the bride and groom rowing a yellow canoe.They also sent me a photo of the actual canoe lodge where the wedding is supposed to take place, and I drew them the canoe lodge setting according to that photo. Getting married? Want a caricature for your wedding invitation as well? I’ll draw a caricature of you for your wedding invitation, in a similar style, in a setting of your choice. Click here for additional details. This is a sketch style illustration (a monochrome classical sketch) that I drew for a wedding invitation. It shows the loving groom and bride holding each other, smiling and looking at each other’s eyes romantically. Do you want a similar illustration or a caricature for your wedding invitation? I will draw you a beautiful sketch in a similar style. Click here for more information. This is another wedding invitation caricature that I recently drew. It shows the groom holding a microphone, kneeling before the bride and serenading to her. The bride, wearing her wedding dress and holding a red bouquet, is smiling shyly at him. 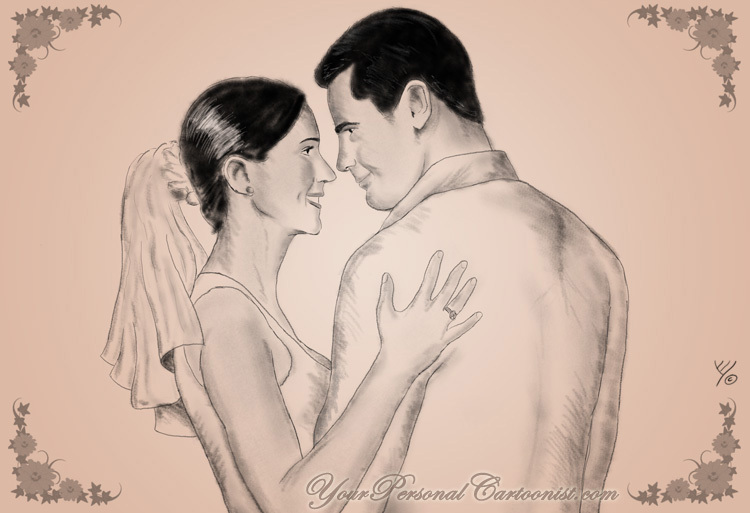 Do you want a caricature for your wedding invitation as well? I will draw a caricature of you for your wedding invitation, in a similar style, in a setting of your choice. Click here for more information. This wedding invitation caricatures is a personal favorite of mine. The couple had a seaside wedding ceremony and they asked me to draw something that would reflect that. I drew the groom is holding the bride while standing on a seaside podium. The setting sun, along with the lightly cloudy sky and distant seagulls, give the whole scene a romantic flavor. Do you want a unique wedding invitation as well? 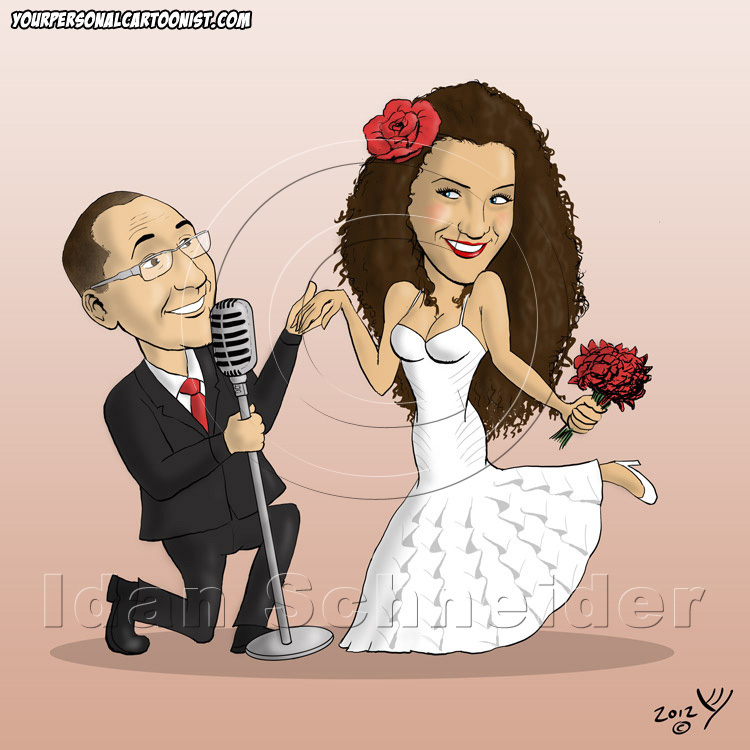 I will draw an original caricature of you for your wedding invitation, in a similar style, in a setting of your choice. Click here for more information. 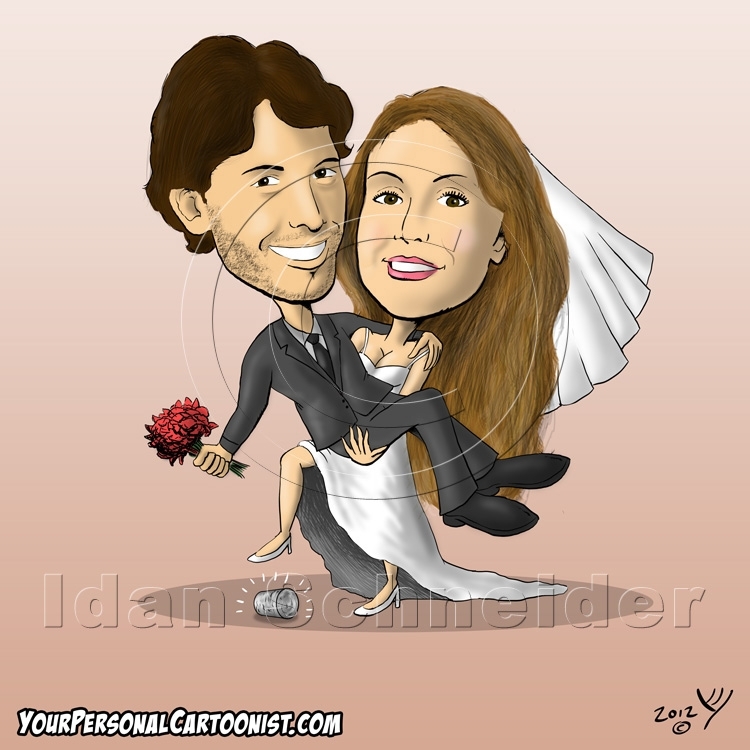 I drew this wedding invitation caricature for this lovely Jewish couple. It shows the bride carrying the groom (in a “reverse of classic roles”). For anyone who’s wondering what’s that shiny object under the bride’s foot – according to Jewish tradition, after the couple has been officially declared husband and wife, they both drink wine from a glass and then the glass is wrapped with a bag or tin foil and placed under the groom’s foot. The groom crushes the glass with his right foot (for good luck), and this begins the official marriage celebration. In this caricature, the glass is placed under the bride’s foot, while the groom holds the bride’s flower bouquet. Do you like this caricature wedding invitation? I will gladly draw your caricature for your wedding invitation, in the same style, in a pose of your choice. Click here for more information. 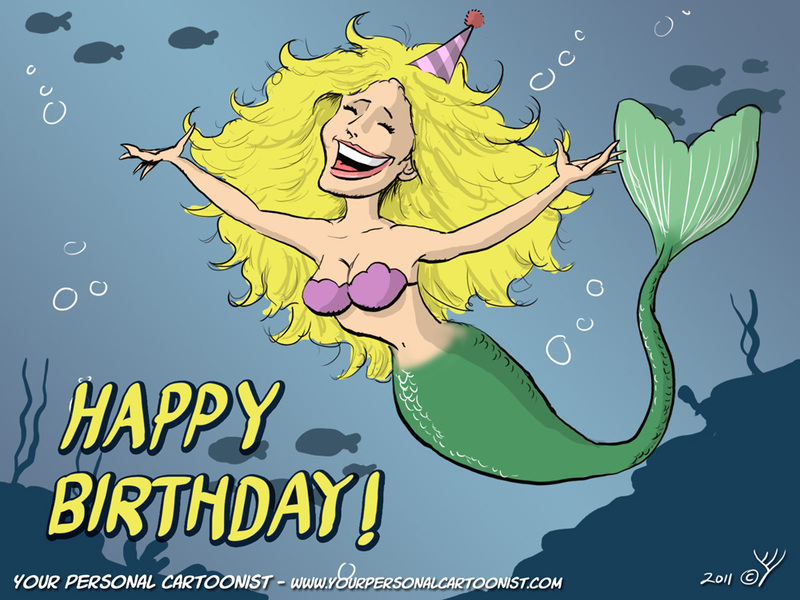 A cartoon mermaid, swimming happily among the fishes with her blond hair flowing, wearing a birthday party hat and shouting “Happy Birthday”! 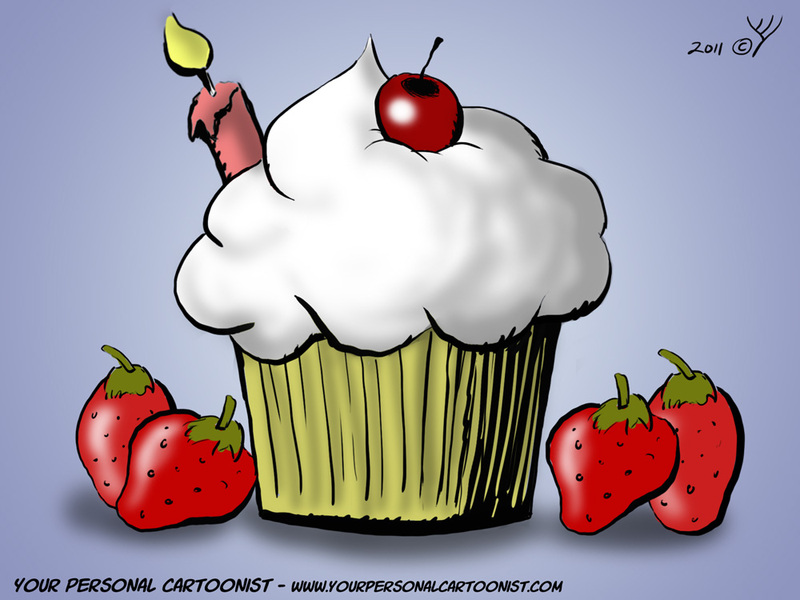 This cartoon is great for using as an online greeting card, for birthday invitations and birthday gifts. In fact, it’s already used in the Happy B’day iPhone app, and can be sent as an electronic happy birthday card on Facebook, Twitter or via e-maiil. Do you like this clip art? License it now for a low price and print it on your birthday card, gifts, invitations, and party favors. You can also order a similar personalized cartoon or your caricature from a photo! A cartoon of a delicious cupcake, sorrounded with strawberries, with a cherry on top. This cartoon is great for using on birthday invitations, birthday gifts, printing on a T-shirt etc. In fact, it’s already used in the Happy B’day iPhone app, and can be sent as an electronic greeting card on Facebook, Twitter or via e-maiil.